Thomas Alva Edison was the most famous and prolific inventor of all times. He was an American inventor and businessman. He invented and developed many devices that greatly influenced life around the world. Thomas Alva Edison was one of the greatest American inventors; most of his invention is related to electricity and power. He has developed many devices in the field such as electric power generation, mass communication, sound recording and motion picture. The United States of America had issued this one dollar in the year 2004to celebrate the 125th ANNIVERSARY OF THE LIGHT BULB’. 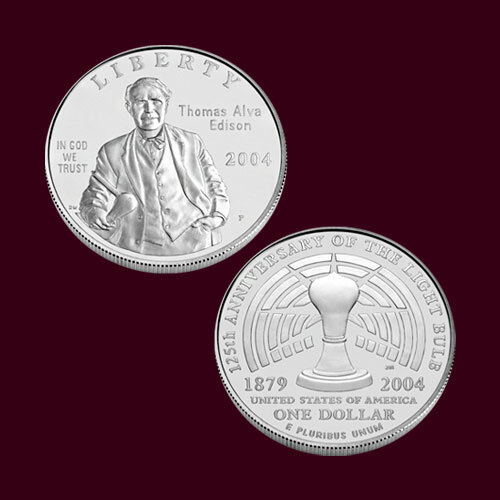 The obverse to this coin depicts the portrait of Thomas Alva Edison with the Inscription ‘LIBERTY’ at the Top; ‘Thomas Alva Edison’ and date 2004 at the right side of the coin and the inscription ‘IN GOD WE TRUST’ at the left side of the coin. The reverse side of the coin depicts the image of Edison’s bulb with the inscription ‘125th ANNIVERSARY OF THE LIGHT BULB’ around year ‘1879 and ‘2004’is written at the left and right side of the coin and the inscription ‘UNITED STATES OF AMERICA’ and ‘ONE DOLLAR’ with ‘E PLURIBUS UNUM’ at the bottom side of the coin.